We are very unfortunate to announce the temporary cancellation of four Pestilence shows. Pestilence cannot perform on March 10th in Gran Canaria, and the release shows in The Netherlands the weekend after (March 15-17). Our thoughts are for the moment with Pestilence’s guitarist Calin Paraschiv, whose father passed away yesterday. Options to fulfill our obligations with an incomplete version of Pestilence were considered, but put aside because we want to do things right only. We are currently rescheduling these shows, we will do our utmost best to do them in the near future. Helaas zit het deze keer een keer niet mee en hebben we het besluit moeten nemen om vier Pestilence shows voorlopig af te zeggen. Het gaat hier om het optreden de 10e maart op Gran Canaria, en de “Hadeon” releases shows in het weekend daarop volgend (15 t/m 17 Maart). Op dit moment gaan onze gedachten uit naar Pestilence gitarist Calin Paraschiv, wiens vader gisteren overleden is. We hebben nog met het idee gespeeld om de shows toch te doen met een incomplete Pestilence line-up, maar we laten het streven naar kwaliteit prevaleren. Momenteel worden de shows opnieuw geboekt, en we doen ons uiterste best om ze op korte termijn in te halen. Na het overweldigende succes van de Europase “Fight The Plague” tour komt Pestilence terug op Vaderlandse bodem om eindelijk “Hadeon” voor te stellen aan de fans. De nieuwe line-up rondom Patrick Mameli heeft zichzelf gedurende 4 weken (en 12 landen) van zijn allerbeste kant laten zien, en iedereen, fans en pers, is het er unaniem over eens dat Pestilence terug is gekeerd waar de band behoort: aan de top van de internationale Death Metal scene! Het nieuwe album “Hadeon” is inmiddels op de mensheid losgelaten en zal tijdens 3 clubshows worden voorgesteld, met knallende support van twee toppers uit de Nederlandse Metal scene, Dead Head en Inquisitor, die het al niet geringe vuurtje dat rondom Pestilence hangt nog verder zullen opstoken. Deze shows mag je niet missen, zeker niet als je de Nederlandse Metal scene een warm hart toedraagt en deze scene support! 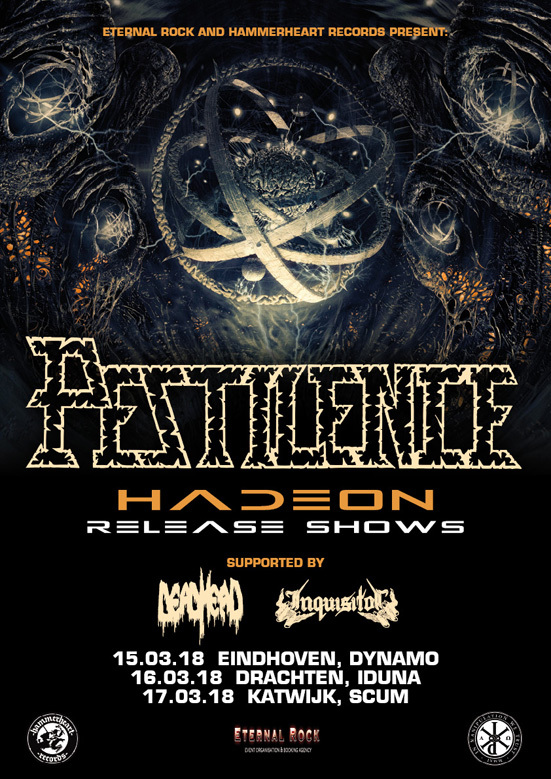 Pestilence releases “Hadeon” digitally to coincide with “Fight the Plague” European Tour start! 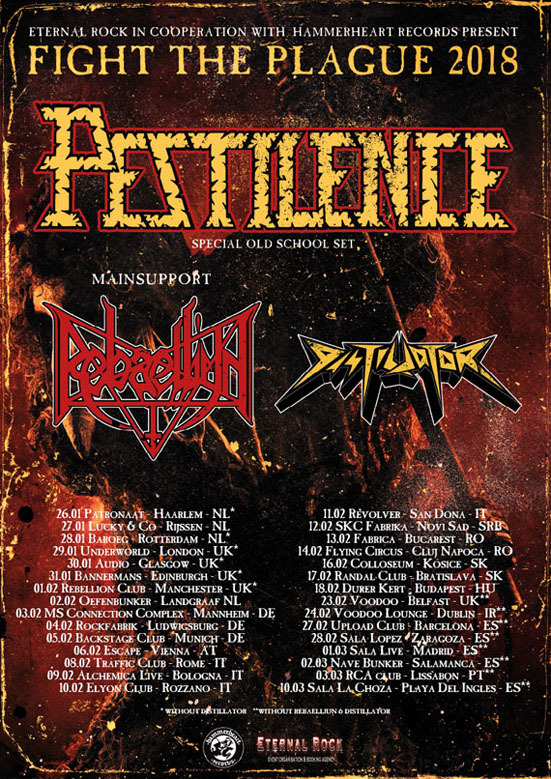 Today Pestilence embarks on a month long European tour under the name “Fight the Plague”, and will perform an old school set consisting of songs from their first four classic albums. After the tour “Hadeon” will be released, the new album, in the first week of March. As a special treat to all our fans worldwide the album is available digitally for your ears from today on! So check “Hadeon” on Bandcamp, Spotify, Itunes, or any other reliable streaming source. We are confident enough, and proud enough to let it coincide with the tour start, enjoy! Pestilence releases second single from “Hadeon”! 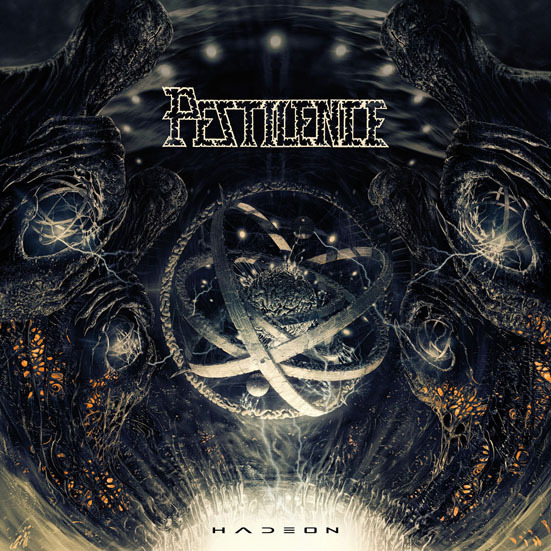 Pestilence gives in to fans craving for more songs from “Hadeon” with the second single from that upcoming killer album. “Non Physical Existent” is the opening song on “Hadeon” and features once again all the Pestilence trademarks we love them for. A perfect mixture of old school riffs, brutal vocals, insane and innovative leads and some small progressive touches, that is what you can listen to now. A track that is insanely catchy and will surely become a live highlight. See you all across Europe soon! Reactivated Dutch death metal legends Pestilence have officially joined the Decibel Flexi Series, and this exclusive new track, “Hypnotic Terror” was recorded during the sessions for the new Pestilence LP, Hadeon, which is slated for a March release via Hammerheart, but this exclusive new single track will not appear on the album. And the only place you can experience it is via t…he Decibel Flexi Series, of course. So, if you want to complete your Pestilence discography, don’t hesitate! Pestilence’s “Hadeon” pre-orders are up! The legendary Dutch death dealers Pestilence are back! Pre-order the new album “Hadeon” now in various variants. We expect to ship early february! After the “Fight the Plague” European tour Pestilence will present their new album “Hadeon” to their home country’s fans. On March 15th, 16th and 17th Pestilence will play Eindhoven, Drachten and their home town of Enschede. For these shows the focus will be on the new album, but obviously the band will treat their fans to a set list full of highlights. After this weekend Pestilence will embark on their South-American journey!